For a couple years, I was a faithful user of Naver’s English Dictionary extension for Chrome, which works by bringing up a side panel window with the definition of any Korean word that you double-click on. It was nice, but I have a bad habit of highlighting and unnecessarily clicking on words while reading stuff online, so more often than not, I’d end up triggering the extension on an English word or a Korean word that I already knew. That meant many instances of loading multiple windows, having to exit out of those windows, using up memory, and slowing down my internet speed. Eventually I got to a point where I could understand 80% of the content I was reading on the internet (i.e. manhwa, celebrity interviews), so I deleted the extension and got by using context clues and the Daum dictionary webpage when needed. The problem is, I’ve basically reached a vocabulary plateau with Korean because I keep reading the same type of thing time and again. 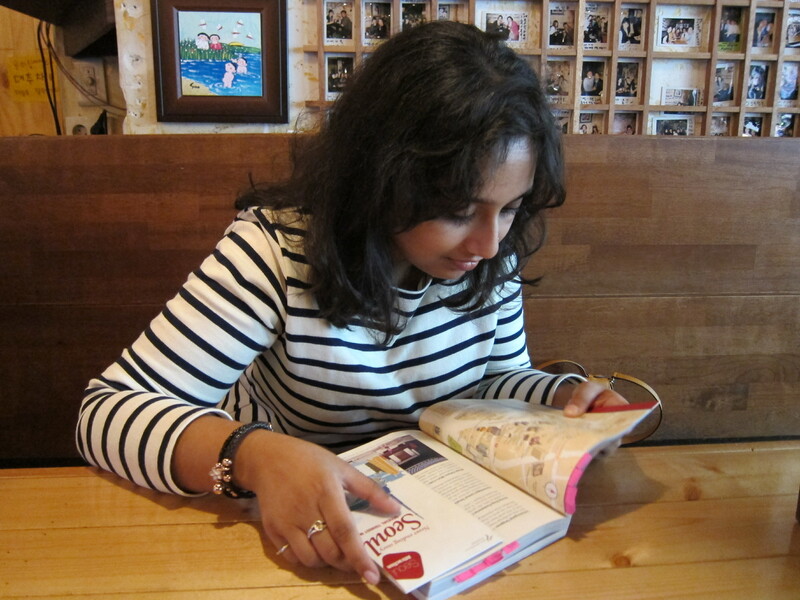 So lately, I’ve been making an earnest effort to read more diverse content…. but that meant having to look up a lot of new words. Instead of going back to the Naver extension or choosing to laboriously look up each word I was unfamiliar with on the dictionary webpage, I’m utilizing a really awesome new Korean-English popup dictionary extension for Chrome. This extension is super convenient. All you do is hover your mouse over a Korean word and the English definition pops up in a tiny blue box below it. No new browser opens, there’s no delay, and you can toggle the extension being on/off on a page quite easily. This lets me read more quickly and smoothly than I ever have before. Overall, there’s really not much to criticize. As of now, the definitions only appear in English and there’s no way you can toggle to Korean definitions (sometimes I find it easier to understand the nuance of a word when I read the definition in Korean), nor can you look up the Korean equivalent of an English word, but the extension is still rather new so I’m sure there’s room for improvement and refinement in the future. Now I really have no excuse to not read more Korean. EDIT: Here’s a link to the extension in the Chrome Web Store. Before I start, an extra special shout-out goes out to my loveliest of lovelies, Jeannie, who sent this book along with a stash of other goodies from Korea. She’s forever spoiling me with gifts. I am so lucky to know you, dear – and not just because you’re my Sugar Daddy. Haha. I have to admit, I distanced myself from Korean culture and history during my first year of studying the language because a part of me felt that if I learned too much about it, I might come across as a Korean “wannabe.” As it is, I still keep my passion for Korean a bit under the wraps, but I’ve come to realize that one cannot divorce a language from its culture. The better I get at Korean, the more I want to know about Korea itself. And on that topic, a few weeks ago while I was watching 아랑 사또전, I decided I wanted to know more about 고수레, or food that Koreans put out to appease ghosts. I googled it, browsed few websites, and eventually came across an excerpt from a book called 옛것에 대한 그리움. The same site had posted other excerpts from this book and all of them seemed to be about certain aspects of Korean culture. It looked really interesting and informative! Author Kim Jong-tae’s primary aim in writing this book is to preserve Korean history and tradition in the current day and age. In the face of rapidly evolving technology, our fast-paced, modernized selves often forget the religious or cultural traditions of our parents and grandparents – which means they will be equally missing in our children’s and children’s children’s lives as well, perhaps gone for posterity. This book means to save that on the behalf of present day Koreans. In fact, the whole book can be summarized succinctly by the its tagline: 잊혀져 가는 거의 모든것의 아름다운 풍경. 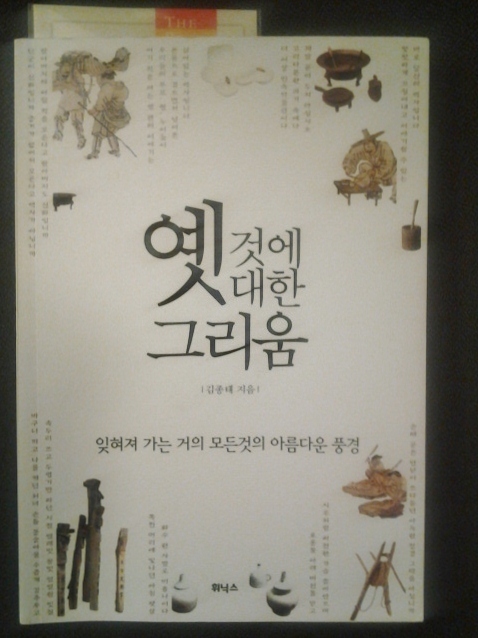 The book is divided into five sections, each having a certain theme, and each section contains several different Korean cultural/traditional points. Each topic gets about a four-page passage dedicated to it, explaining what it is, where it originated from, and what its significance is. 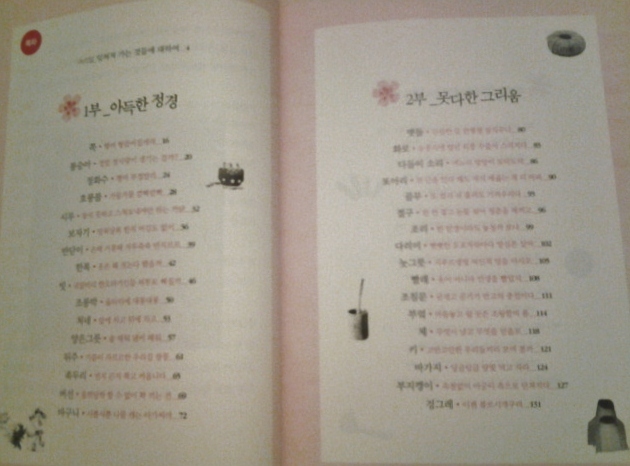 Below is a snapshot of the pages describing 고수레. Some topics even have photographs accompanying them. 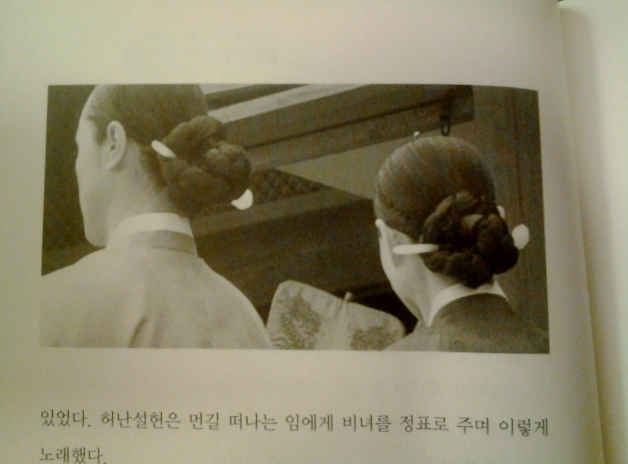 This one was from the passage describing 쪽 (a woman’s chignon). Other passages include 장승, 소리 (an entire section about onomatopoeia! ), 바구니, 봉숭아, 놋그릇, plus tons more. This is such a lovely little book. A good, informative read, and definitely a good way to spruce up one’s vocabulary. I definitely recommend it to anyone who has an interest in Korean traditions. March 13, 2011 January 6, 2017 by Archana2 Comments on Kotoba! Learning Japanese? Have an iPhone, iPod Touch, or iPad? Then you have to check out this app! Kotoba! is one of the best electronic dictionaries I’ve ever come across – scratch that, it’s possibly the best overall app that I’ve ever come across. I use it almost every single day and it’s helped me tremendously with my Japanese. In each entry, you get the reading, the part of speech, the major conjugations (if it’s a verb), the type of adjective (い- or な-), example sentences, and Kanji decomposition. If it’s a verb you can view the following conjugations: present/future tense, past tense, continuative/て-form, presumptive, past presumptive, provisional, conditional, and alternative forms. If it’s a compound word, you can click on the individual Kanji and get 音読み (onyomi) and 訓読み (kunyomi) readings IN ADDITION to pinyin and Korean readings! MY FAVORITE FEATURE: Animations of Kanji stroke order! I love using this to learn how to write new Kanji! And the best thing about this app is that it is COMPLETELY AND TOTALLY FREE. Yes, you read that right. It’s unbelievable. I’ve seen super-expensive apps and electronic dictionaries that can’t do half of the things this app does. For more information and screenshots, check out the official website. Like what you see? Download from iTunes. Seriously people, this app is a dream come true.